Bok globules are isolated dark clouds. Wolf, Launhardt & Henning (2003) have studied the relation between the magnetic field and outflow directions. Figure 1.21 displays the direction of the magnetic field obtained with JCMT-SCUBA polarization observation in 850 m as well as the outflow found by CO observation of Chandler & Sargent (1993) and CO observation by Yun & Clemens (1994). In B 335, CB 230 and CB 244 outflows are oriented in the direction perpendicular to the major axis of the globules. The magnetic field is running parallel to the outflow but perpendicular to the major axis. This means that a disk is formed with a gas flowing along the magnetic field. Further, the outflow is generated by a twisted magnetic field which is an outcome of a rotating disk. 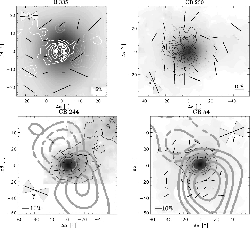 In globule CB 54, the alignment is not perfect, that is, magnetic field direction is slightly aligned with the outflow (Wolf, Launhardt & Henning 2003). This seems to stengthen the magnetic origin of the outflow and magnetically guided disk formation. It is clearly shown that the polarization anti-correlates with the intensity of the thermal emission. This might be due to the observational error in the low intensity region (or low S/N region). This may be related to physical processes such as (1) the alingnment owing to the magnetic field becomes inefficient in high density region or (2) the magnetic field is tangled in the dense region and the polarization due to the aligned dust is canceled. Figure 1.21: Directions of magnetic field are shown from the linear polarization observation of 850 m thermal emission from dusts by JCMT-SCUBA. These four objects are known as Bok globules.